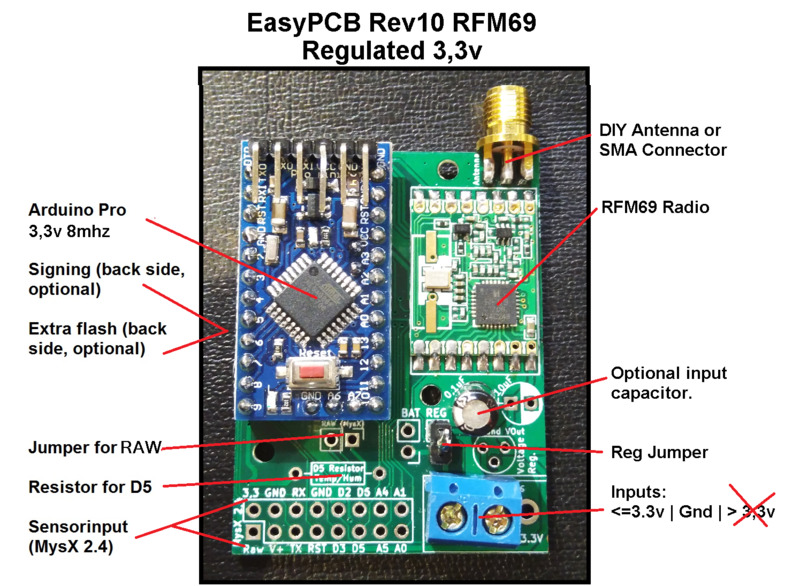 This is the RFM69(HW/W) edition of EasyPCB! 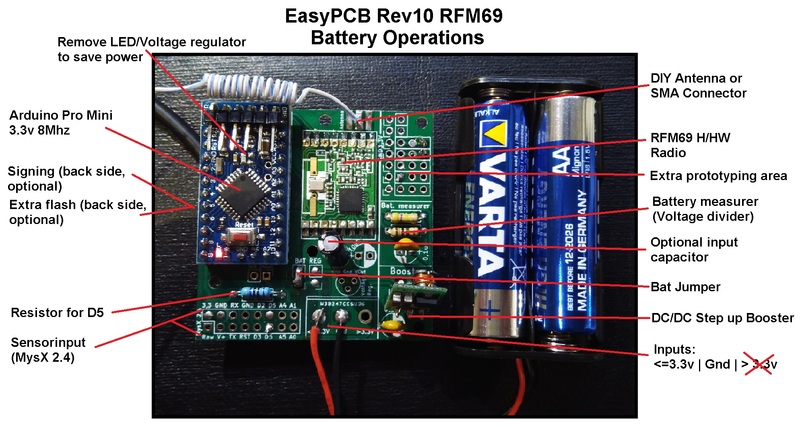 If you want the original EasyPCB with Nrf24l01+ transceiver - go here. Use BAT jumper and make sure you have a booster attached to close the circuit. Connect the batteries to right input marked "<= 3.3v"
Power consumption (without booster) in MySensors sleep() mode (Ver 2.2) was measured to 5,2uA which will last a node (depending on how often it transmits) a long time! Use REG jumper and connect 3.3v to right input marked "<= 3.3v"
Only the lower capacitor marked 0.1uF affects the RFM69 module! The capacitor marked 10uF only affects the input of the voltage regulator. Nu jumper should be connected and connect your power to left input marked "> 3.3v"
With REG closed you will feed everything (Arduino, Radio and Sensors) with whatever voltage the battery holds. You can´t use any sensors which require higher voltage than the current battery status (without using a DC/DC Step up booster for the sensor). With this configuration, you can measure VCC supply level without external components [Library]. Lowest working voltage (depending on added sensors) will probably be the RFM69w module which can handle down to 1.8v. 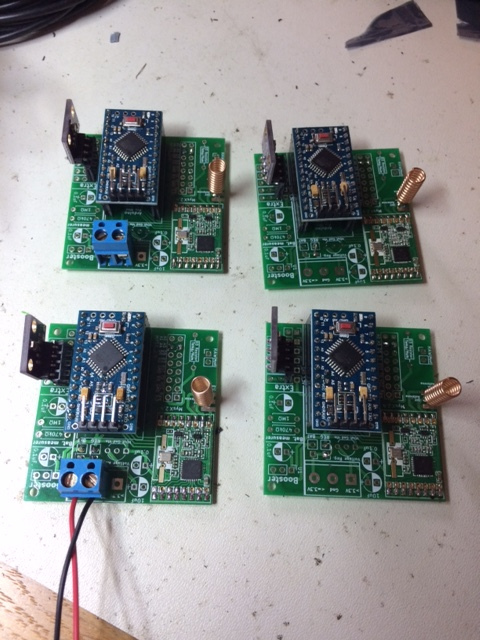 Do not use any DC/DC step-up booster or voltage regulator to feed the Arduino or radio! To lower BOD you can use standard Pro Mini bootloader and change boards.txt. See here for instructions.. This will give you some more battery (down to 2.2-2.4v?) but use the 8mhz external crystal at lower voltages will be risky (at least at 1.8v, radio minimum) so it might be a good idea to run a bootloader @ 1mhz internal oscillator. 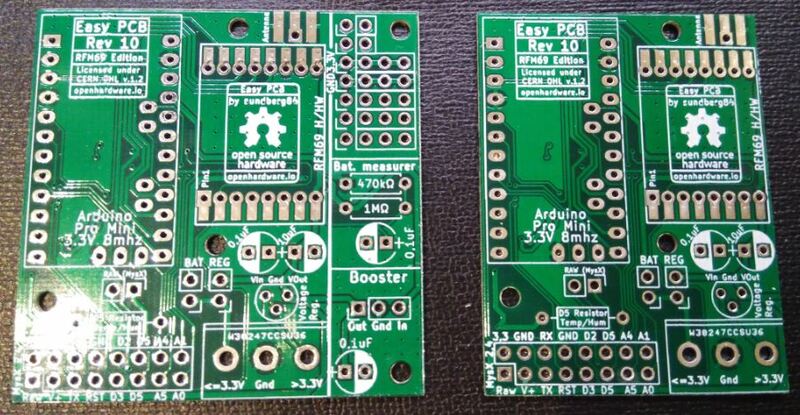 A great video by @wez on how to assemble the EasyPCB with Booster and Battery (timelapse). A good example on how to build modular which allows to remove or change hardware if something goes wrong/stops working or you just want to re-use the sensor in the future for something else. More videos can be found looking at the Nrf24l01+ version. Its the same build except for another radio. You need to attach an antenna to the board. The antenna needs to be single core inside, not multi-wire like you can find in common dupont cable. Aside from not working without an antenna, transmitters can be damaged if they transmit without an antenna present. For this PCB you can either attach an SMA connector and buy an antenna with that connector or make do it yourself. There are a lot of tutorials out there, and for 433mhz I suggest this tutorial. 5x3,5cm for cut PCB/regulated voltage and 5x5cm battery operations with extra prototyping space. REG: Use this if you are using 3.3v regulated DC. Download from this page to get KiCad and Gerber files. If you want a faster shipping time or fewer pieces you can order from me on Ebay.